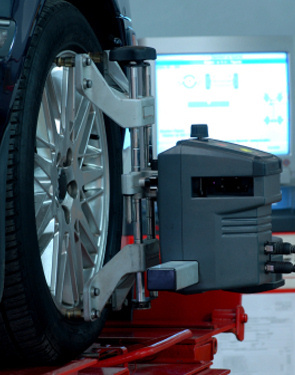 Kwik Kar offers a fully computerized alignment with a state of the art alignment system. Improper alignment is a major cause of premature tire wear and poor handling. Over the years, a properly aligned vehicle can add thousands of miles to tire life. Gas mileage increases as rolling resistance decreases. Wheel alignment sets all four wheels parallel which, along with proper inflation, minimizes rolling resistance. Does your car pull to one side, does the steering wheel vibrate, do you constantly have to move the steering wheel to keep your car traveling straight ahead? Many handling problems can be corrected by wheel alignment. With all the system components aligned properly, road shock is more efficiently absorbed for a smoother ride. A suspension system inspection is part of our alignment procedure. This allows us to spot worn parts before they cause costly problems. Kwik Kar recommends an alignment service any time the symptoms described above occur. Not all Kwik Kar locations perform service alignments, please check with your location.